A controversial report released yesterday reveals that tens of thousands of Irish children were sexually, physically, and emotionally abused over six decades in workhouse-styles schools run by the Roman Catholic church. The 2,600 page report details the casual and ritualized abuse that occurred in more than 200 schools from the 1930s to the 1990s. The report was produced by a a state-run commission which has been hearing testimony from 1,060 former students and studying church records of unreported abuse cases for the past nine years. The mostly church-run schools were established to care for neglected, orphaned or abandoned children, but the report reveals that the roughly 30,000 children who attended the schools were often sent there by priests who put pressure on their families. Children who were born out of wedlock, whose parents couldn't afford them, or had committed a petty crime like stealing food were often sent away to the reformatories. Many of the victims, who are now 50 to 80 years old, say they did not learn who their parents were until they were adults, and many said their parents tried unsuccessfully to reclaim them. Though the abuse was more severe in the boys' schools, girls were also subjected to routine sexual abuse, often by more than one person at a time, and ritualized beatings. Some of the schools were essentially workhouses, and at one girls were given daily quotas of how many hundreds of rosaries they had to string per day. The report reveals that the government and the Catholic Church conspired to cover up the abuse, creating a "culture of silence." Ireland's Department of Education would announce their cursory inspections and let the church handle accusations of abuse internally. Perpetrators were usually just transferred to other institutions. The Washington Post reports that in one school two people charged with abuse continued to care for children for 14 years without the authorities taking steps to remove them. 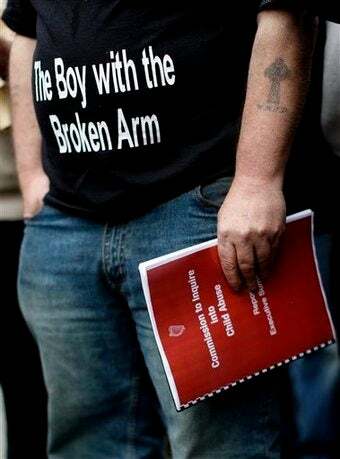 The report was delayed because the Christian Brothers, the religious order that ran many of the boys' schools, sued successfully to have the abusers' names omitted. Many victims are furious, because the omission means that the report can't be used as a basis for prosecutions. According to The Los Angeles Times, leaders of the religious orders have claimed that victims exaggerated the abuse, and argued that according to the standards of the day, the sexual abuse of children wasn't considered a criminal offense but a moral failing. However, the report points out that when laypeople were accused of child abuse the clergy would turn the cases over to the police. The Irish government has paid $87,000 on average to 12,000 victims in compensation so far, but many of the former students have refused the money because it would require them to waive their right to sue their abusers. "We expected that these people would be named and shamed and that some of them would be convicted," said John Barrett, who testified before the commission about the abuse he suffered at a school for boys with learning disabilities in the 1960s. He added, "At the end of the day, some of us won't sleep tonight. We're still nowhere near the truth."